And I'm sure less pedantic readers (and those in more of a hurry) thank you accordingly. Love the way threads here can veer from deep technical discussion to consideration of the soul of the creative process in but a moment. Inspirational! ConcertinaChap wrote: Love the way threads here can veer from deep technical discussion to consideration of the soul of the creative process in but a moment. Inspirational! MS101 is now in pre-production where they make 50 units to find any problems before they go into full production. The slight delays have been due to the factory running at near full capacity and basically not having any time to fit in the production of new products. Looking at tyhe picture that uli has posted they look good and accordimg to one of the beta testers it's as near as the same size as the original. Personally, I've never understood why people love them quite so much, but whatever floats yer musical boat, and all..! desmond wrote: Personally, I've never understood why people love them quite so much, but whatever floats yer musical boat, and all..! Nostalgia. They were relatively cheap at the time so lots of synth players had one - myself included. 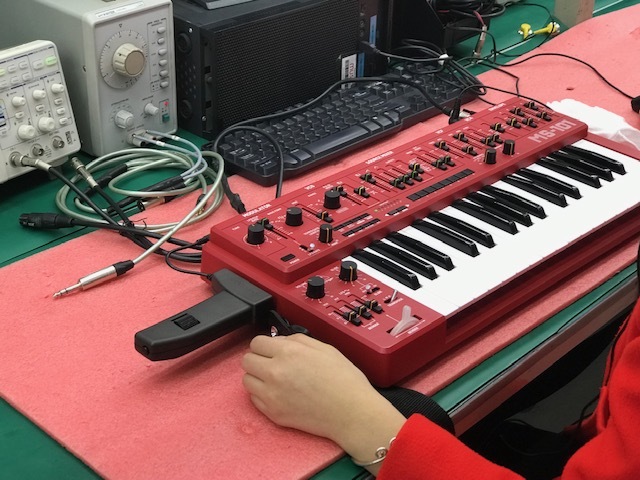 Of course nearly all of us wanted something with two oscillators and two envelope generators, but a synth with those features cost considerably more. +1 This isn't one I'll be chasing. I quite like the 101. This is probably a bit of nostalgia - it was my first synth - but it also slots into tracks quite nicely. Yes, we all lusted after things with more oscillators, but quite a few of us regretted parting with the simpler, fun one. I can see a space for that sound in my collection - not sure if it would be this or a System-1m. Will have to see. As much as I'm looking forward to their 808, I think I'd rather have the Roland Boutique for this one. That bender looks like it will glow, and when Behringer light things up, they do so with LEDs that could attract an alien craft from the other side of the Kuiper Belt. Another addition Behringer/music have just been on a little trip to bath where an auction recently took place. Here is the rest of the 40 year old iconic products which we bought from the "Tears fro Fears" auction. PPG Wave 2.2, EMU Emulator II, Prophet 5, Hammond C3 with 2 Leslies plus 2 LinnDrums. Right now we're bringing them to our Kidderminster Care center so we can give them a lot of love so they'll shine again. Our people are super excited and they can't wait to fire them up. We'll keep you posted. There is also an eventide ultra harmonizer and shock! A DX1! And they also bought their DX1, too (which is incidentally what I'm hoping for for Christmas this year, so...). A DX1, PPG Wave, Emulator II, Prophet 5, Hammond C3, and 2 LinnDrums. Come on. I’m talking to you. Come on. Call between 2 and 4 please. Ask for Roland or Curt. I'd like to see someone clone or manufacture a proper hardware sampler. For years I had a Roland W30 which mangled sound in a glorious way and gave the user the choice of creating multisampled instruments and also using loop-based and one shot samples. Of all the samplers that can be bought these, not one of them allows the creation of multisampled instruments that span a keyboard chromatically - at least if there is I'm not aware of it. Sadly I had to retire my W30 as the circuit boards got fried during a power cut and the unit no longer sampled. I have an Akai S2000 collecting dust but have no desire to use it as the mass storage options as now as rare as hen's teeth and clunky. GaryW23 wrote: Of all the samplers that can be bought these days, not one of them allows the creation of multisampled instruments that span a keyboard chromatically - at least if there is I'm not aware of it. Interesting little device for sure, and looks very well implemented but €849 is pretty steep unless someone has a real use for it!